Cushion provides restraint free safety and positioning. The cushion releases easily when the resident stands. It is held in place with Velcro� and is foam padded for patient comfort. Cushion is covered in vinyl and wipes clean easily. 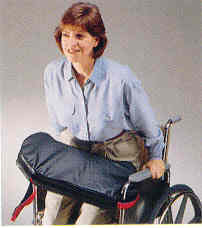 Fits wheelchairs 16" - 18" wide.